The Lamborghini Huracan Eventuri intake system – form and function in sublime harmony. Our aim was to create a flagship intake and set a benchmark for this platform – by using organic curves and prepreg carbon fibre the results speak for themselves. Gone are the awkward cuboid plastic airboxes and in their place is a beautifully engineered system which allows for smoother airflow and releases the glorious roar from the V10 engine. Every detail has been taken into account, from the flawless carbon fibre to the triple layer heat shields ensuring the engine receives cold air without restriction. More power, improved throttle response and an intoxicating induction sound…..benchmark set. The Huracan Eventuri system uses our Patent Pending Carbon fibre Housing which provides an aerodynamically efficient airflow path from the filter to the MAF tube. Not just another cone filter with a heat shield but a unique design which invokes the Venturi affect. You can read more about the housing design and how it works HERE. 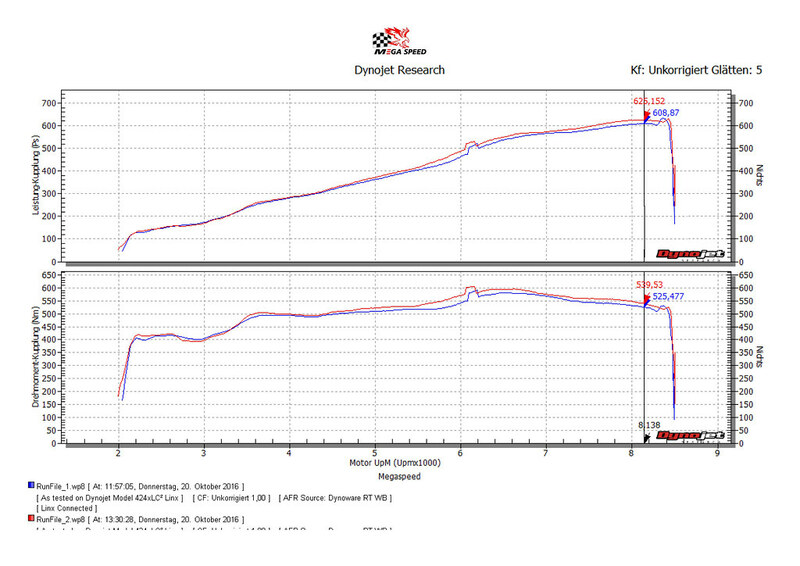 Below is an independent dyno graph showing the comparison between the Eventuri and the stock airboxes on a standard Huracan. As you can see, power and torque are increased through a large portion of the rpm range not just at the peak. This translates on the road to increased part throttle and full throttle response with the car pulling much more eagerly to the redline. The testing was done on the same day back-to-back and temperatures were monitored to ensure consistency. Since dyno results vary between consecutive runs, this graph shows the highest power figure achieved with the stock setup vs the highest figure with the Eventuri.